Affordable Accoutrements: I Want Magic! "I can't stand a naked light bulb, any more than I can a rude remark or a vulgar action. I don't want realism. I want magic! Yes, yes, magic. I try to give that to people. I do misrepresent things. I don't tell truths. I tell what ought to be truth." Sometimes, when I'm setting the stage for a tablescape post, I think of Blanche's words. I don't exactly want to misrepresent things, but I do want to show them to their best advantage. I want them to look a little nicer than they really do; I want magic. Lighting is a huge part of that, isn't it? The table below is an example of what I think of as a "just OK" table. I was still using a flash for indoor pictures, and it shows. The flash washed out the color (not that it was a colorful table) and removed natural light and shadow. In a very kind (and very helpful) critique, Susan of Between Naps on the Porch sweetly asked (knowing the answer, but being a tactful Southern lady), "Are you using a flash by any chance?" I figured out how to turn off the flash, and the photographs began to improve. Some people are steady enough with a camera to take no-flash, low-light indoor pictures, but I've found that I need to use a tripod. As the light fades, the drama increases. I'm almost finished talking. 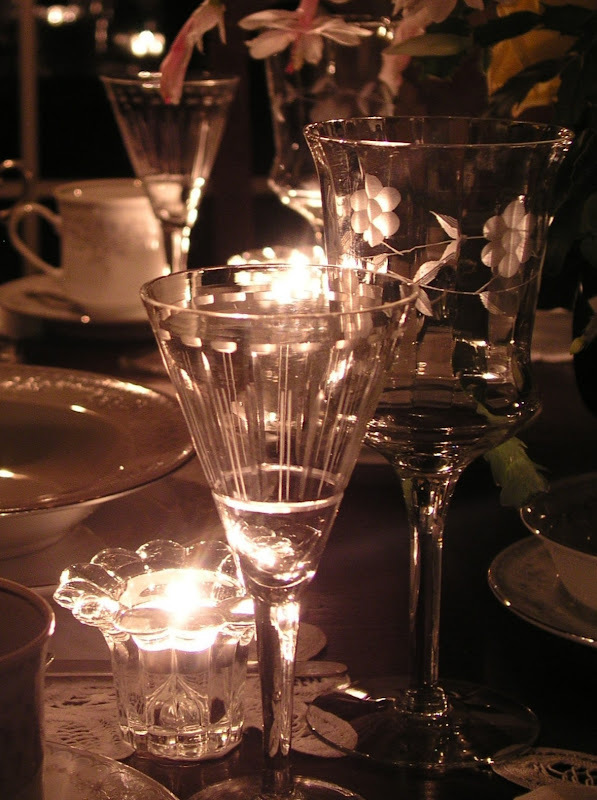 What follows is a sampling of candlelit images from past tablescape posts. I hope you enjoy looking back with me. Here's a short You Tube video with images of British actress, Vivien Leigh, as Blanche from the 1951 film. If you don't care to watch, you might enjoy listening to the music (composed by Bernard Herrmann, from his "Wuthering Heights" opera) as you scroll downward. Thank you for stopping by today! 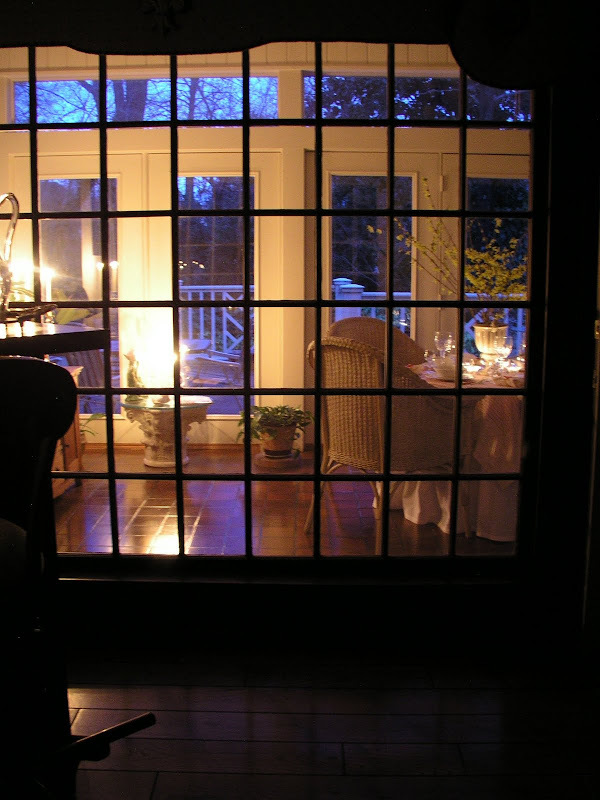 I hope you'll visit Susan of Between Naps on the Porch for Tablescape Thursday. There's always wonderful inspiration from Susan and all her talented participants. This was so image-intensive that I decided not to include links to the original posts. If you want more information about anything you've seen, just leave a comment or send an e-mail to affordableaccoutrements@gmail.com. Bill, I am always pleased when I see you have a new post and open your blog with anticipation. Today, was a special treat with a beautiful review of previous posts. I can't pick a favorite because they are all so good. Breathtakingly magical, Bill. The candles on the stairway...oh my! I love them all. Thank you for sharing them again! whoa! There were quite a few I hadn't seen before. Beautiful pics!! Love the magic! You succeed in bring the magic better then anyone else! I love seeing these gorgeous tables! What beautiful tables. I love how you highlighted the lighting. You captured the blue hour reflecting on the snow even! Wow. I am on the same page with you on lighting, that is definitely where all of the drama is. Thanks for the recap. I have not seen several of these tables. Have a great week! 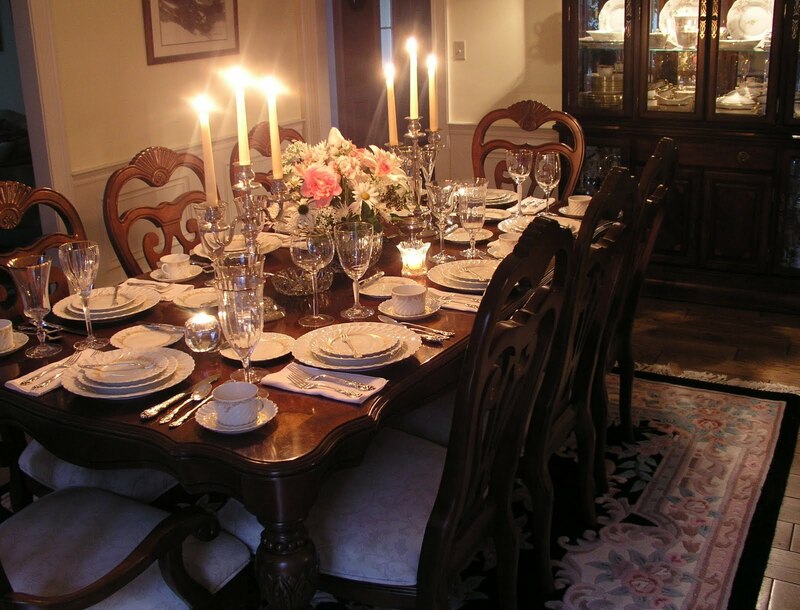 Bill, your photography skills truly are impressive...thanks for sharing your beautiful table each week. OH, oh, oh!! What a wonderful post. I love every one of the photos, flash or no flash. And I agree with Blanche -- I hate a naked light bulb. Of course it makes it awfully difficult to find a chandelier for my entry. I would leave a longer comment, but I am going to go over all the phtos again. Thanks so much for this post. They are as inspiring as they are beautiful. You are the second person in the past 24 hours to mention using a tripod when taking pictures. My daughter just returned from a photographing adventure in Iceland and swears by the tripod. So I must see about investing in one. Even old dogs can learn new tricks. Thanks for sharing your "magic" with us. You do a beautiful job with every table. I look forward to seeing what you've created. Keep it up!!! A great post with fantastic images complimented by a beautiful music score. I've always ASSumed you had some background in photography because of your ability to capture such professional shots and angles. I will have to invest in a tripod. What I have never seem to able to successfully capture are images in candlelight. Thank you for the inspiration Bill. What a lot of work for you to load all those photos but appreciate it! Great to see them all, candlelight is the best. You do well with your camera. This is too much fun! So many of your beauties in one post! I love it! Your photos have always looked fabulous to me, but it is so nice to learn a few of the tricks you have also learned. I always enjoy your posts because I know you will used the candlelighting. I am not that bold as of yet! 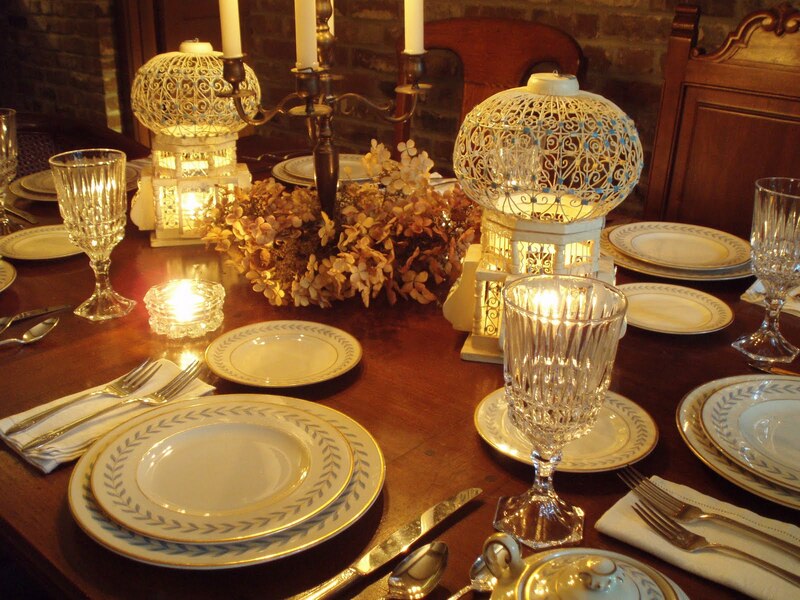 I love the table setting in front of the big brick fireplace! Also the little Christmas table snipet has me really looking forward to those! Happy TT! 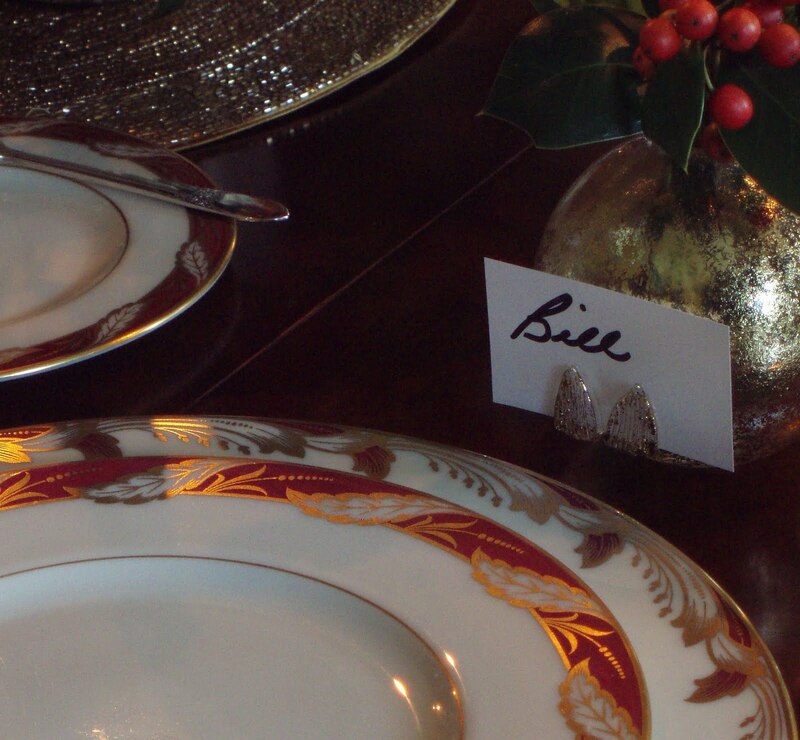 Dear Bill, Your tablescapes are always STUNNING...that's about all the magic I can take! Lovely pictures of eloquent dining. Bill, There are many stunning photographs here! I was so glad to have the chance to see these. 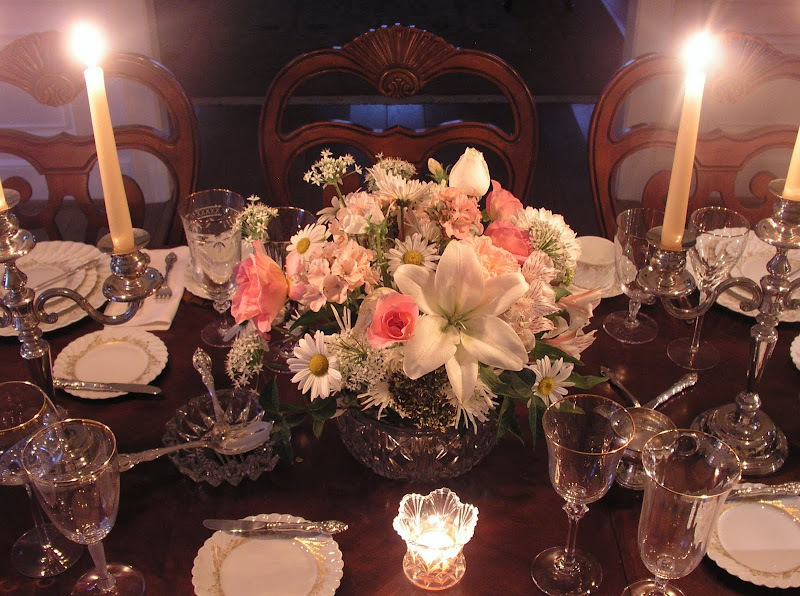 You have many beautiful pieces of stemware and china, and your floral arrangements are always top-notch. This was so fun. I can't keep from looking and going back and looking some more. Just beautiful! I must have missed the first showing of the gold and white placesettings with the blue vase and the colorful tulips. You have them paired with gold leaf stemware. The pattern looks very much like my mother's china. What is the name of your china? Thank you. Wow! Those candle shots are fantastic! Hard to pick out favorites because there are so many pretty things-enjoy! I am mesmerized, glazed over and blown away. 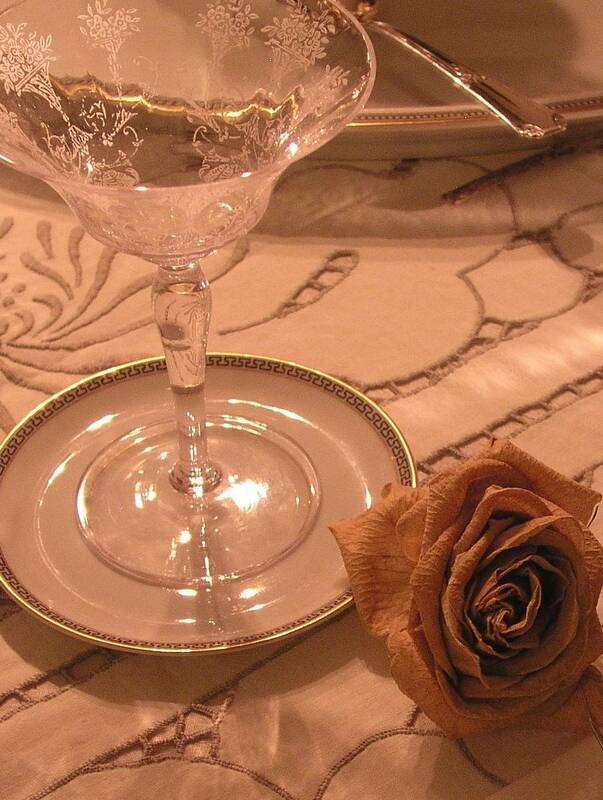 Your tablescapes are something from to learn, to dream of with a hope of an invite.. Perfect feast for the eyes! What a stunning collection of pictures! Thank you for sharing them! Yes, magic!!! They are all magical! I enjoyed seeing it all! I also watched the YouTube! Love the shot on the stairs! Bill, I wanted to thank you for your wonderful comments from last week on my first scape. This whole post is absolutely beautiful. 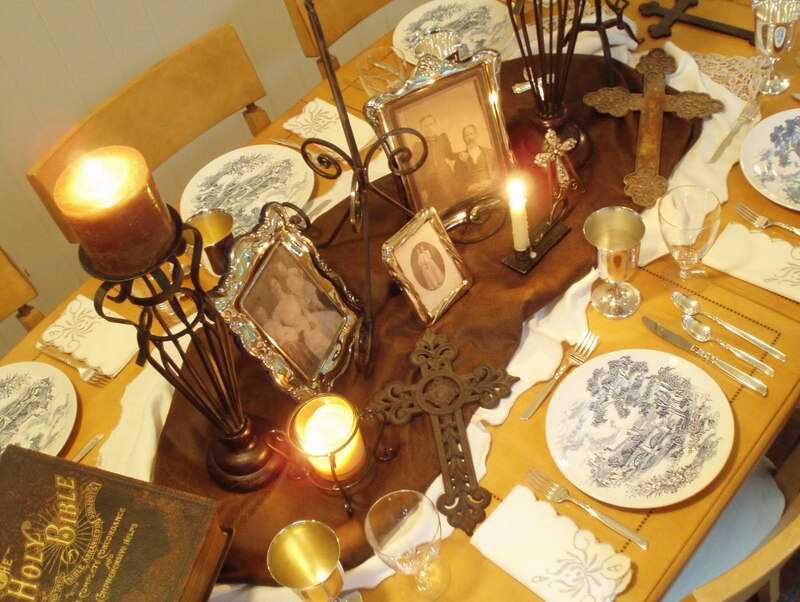 I adore your house pic's and your table settings are wonderful. It's nice to meet you! just exquisite. You are right, very dramatic. The more I scrolled them more amazed I was! Just lovely, the pictures turned out great! Hi Bill! I really enjoyed the recap of your candlelit posts. Your pictures are wonderful. I think we all need magic in our lives! What gorgeous and beautiful tables! Loved the candlelighted ones! Every image is magical. What a difference it makes to photograph without a flash. Once I learned to turn off my flash, my photos dramatically improved. 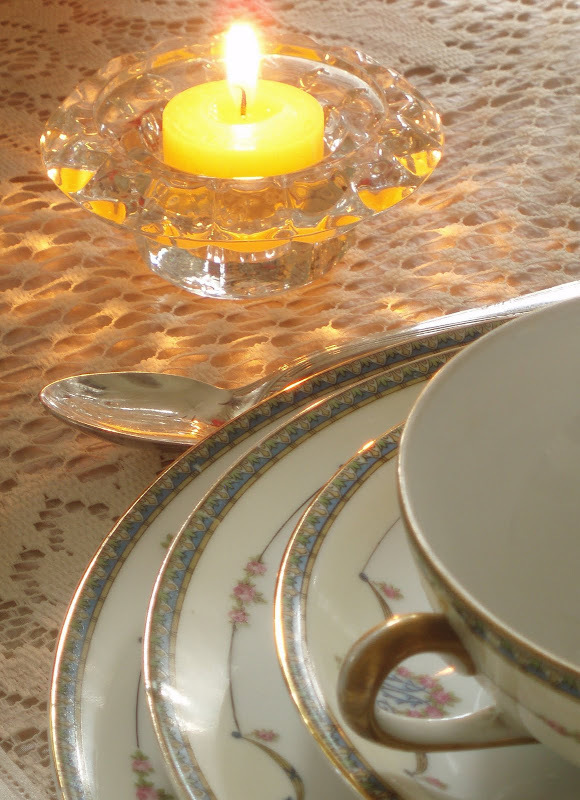 I share your love of photographing candle lit tables. Pure drama--just gorgeous! 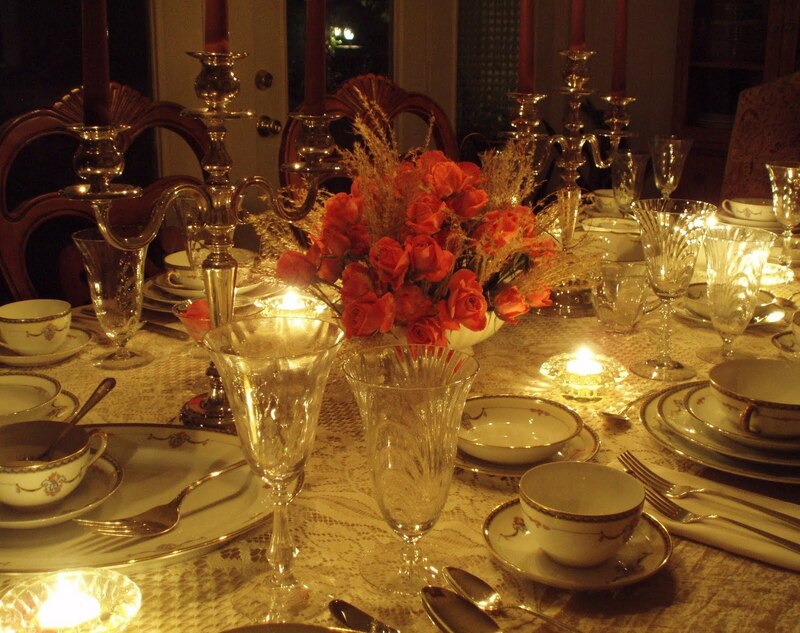 I loved seeing every one of your past tablescapes. All magazine worthy. Oh, Bill! That was so much fun! Thank you for all the effort you put into sharing your wonderful talents and collections with us. I'm sure I speak for all of us "out here" when I tell you how much you are appreciated. I recently got rid of all my darkroom equipment from back when I was a "real" photographer but I did keep my tripod and need to get it out again. I think I've become a bit lazy in that regard. Thanks for the inspiration! Oh, yes, Dear Bill, you do create magic! 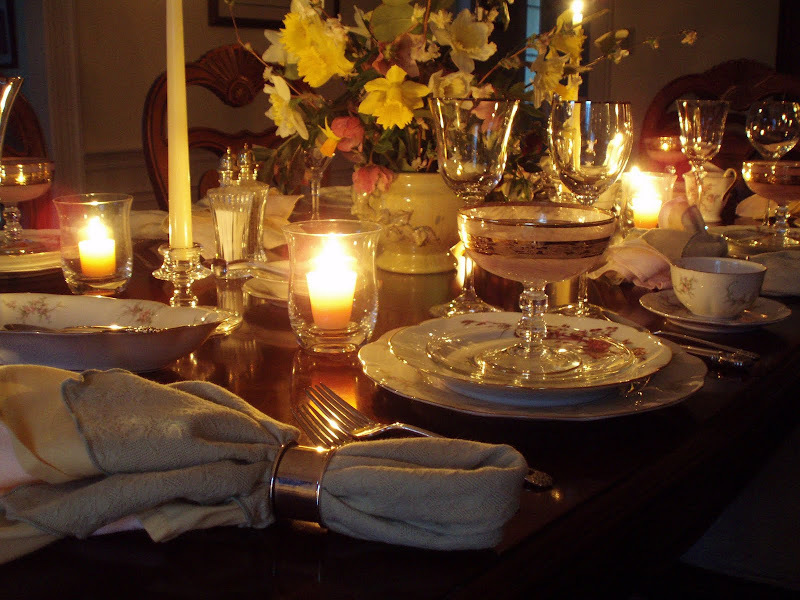 I love it and these gorgeous tablescapes prove it. My most gorgeous baby blues are filled with loveliness looking at your glorious settings! You know I am kidding! Oh Bill, to what occasion do we the honor of this amazing trip down memory lane? So amazing. It made me realize there were one or two I might have missed. Such beautiful work. And I agree, we all need that magic! Just beautiful! I love your tablescapes. Your glassware is divine! At first I thought it was the candlelight and the glass that provided the magic but now I think the candlelight provides the magic to the crystal, china and flowers!!! Very good job with the amazing photos!!! Turning off that flash was the beginning of what has to be one of my favorite things you do... shots by candlelight! These are all WONDERFUL, Bill. My hat is off to you for these amazing shots. "I can't stand a naked light bulb, any more than I can a rude remark or a vulgar action." AMEN! 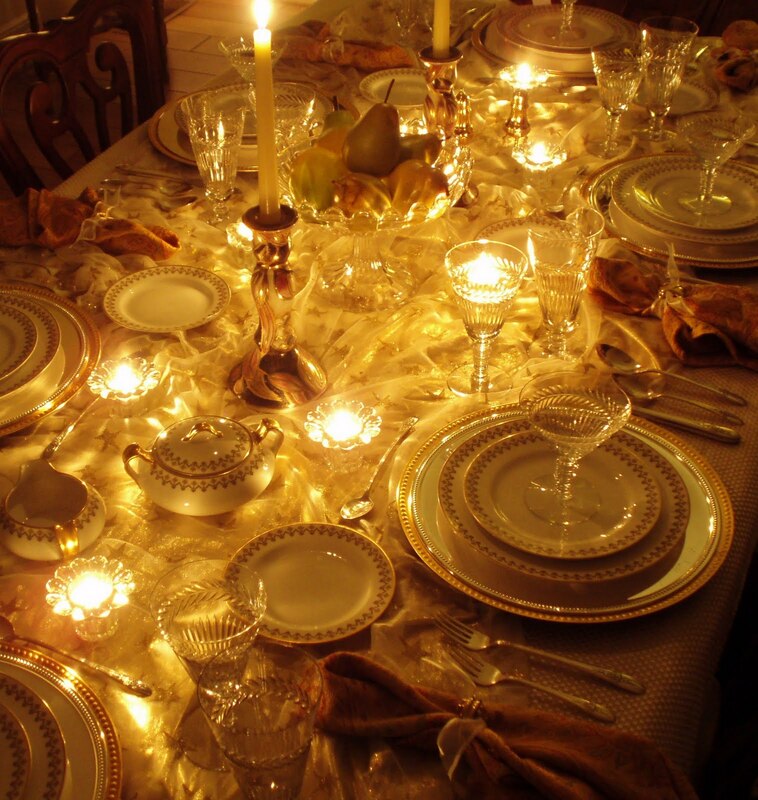 And lighting is key to a beautiful table with yours being stunners! 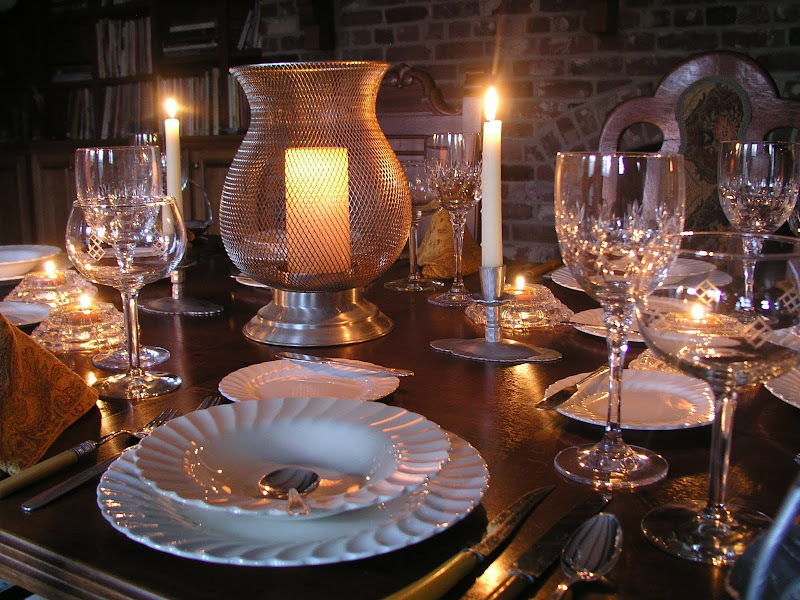 Simply beautiful and inspiring Bill, magic is a lovely choice for your theme and how very true as it seems to be magical the way tablescapers bring together beautiful settings. yes, you are truly a master of magic tables. The review was wonderful. I have really to work on my photos, I guess I buy a tripod as next. May be I get better photos than. Thank you for this gorgeous illustrated lesson. I really adore to learn such things. 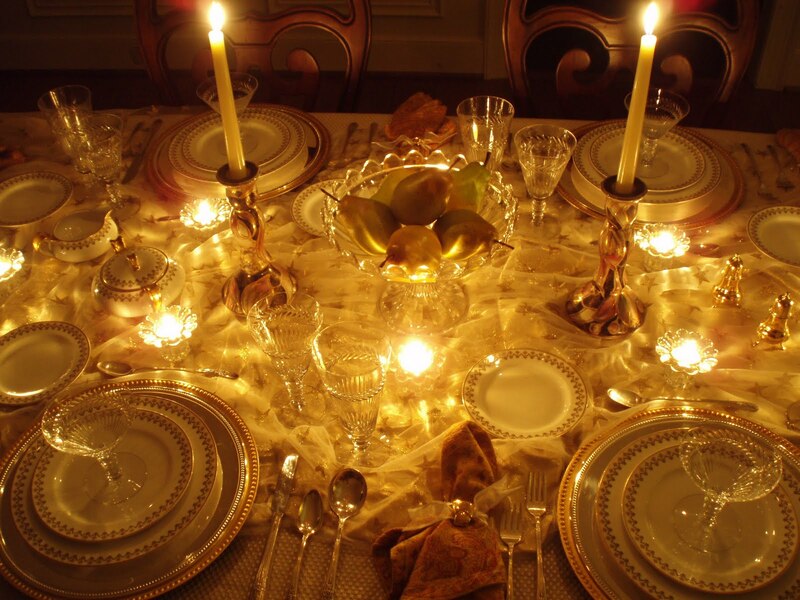 I just love your tablescapes! They are truely magical and so elegent! You have such lovely dishes etc. Thank you for taking the time and sharing. Your tables are exquisite, Bill. I really enjoy the tribute to Janet Leigh. I always enjoy your beautiful tablescapes. 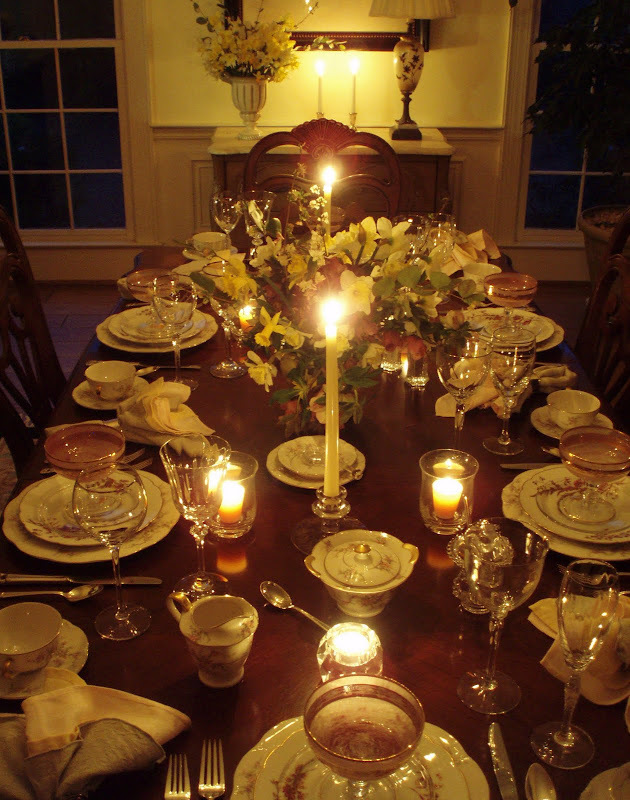 They inspire me to set thoughtful tables in my dining room. Thank you for taking the time and effort to create such magic. You had me at "magic." What an immensely pleasurable retrospective. Most of these treasures I have had, previously, the privelege of seeing, but some are new to me. Whether I've already seen them or not, they are all worth seeing again...and again...the magic is inherently there in every single one. 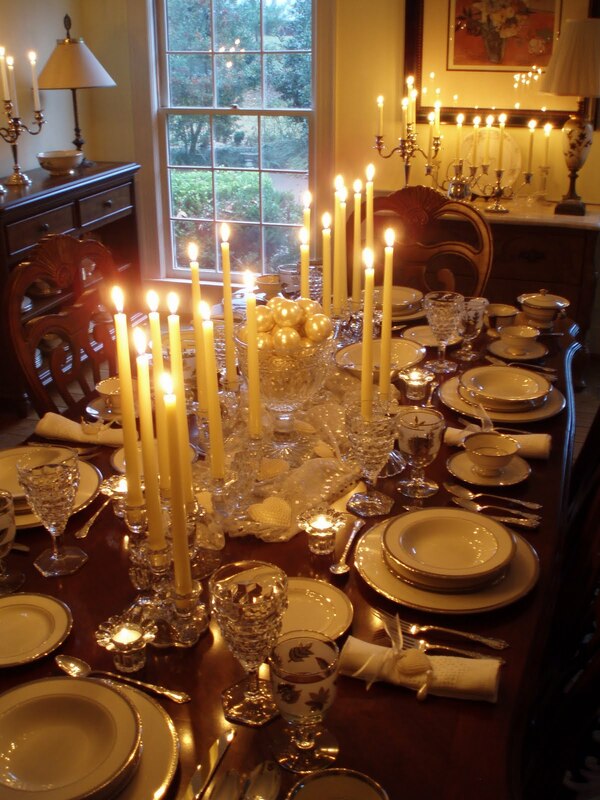 The candlelight, the gorgeous "accoutrement" coupled with stunning details such as fresh flowers or....the list could go on and on as every facet of what you do is wonderful. 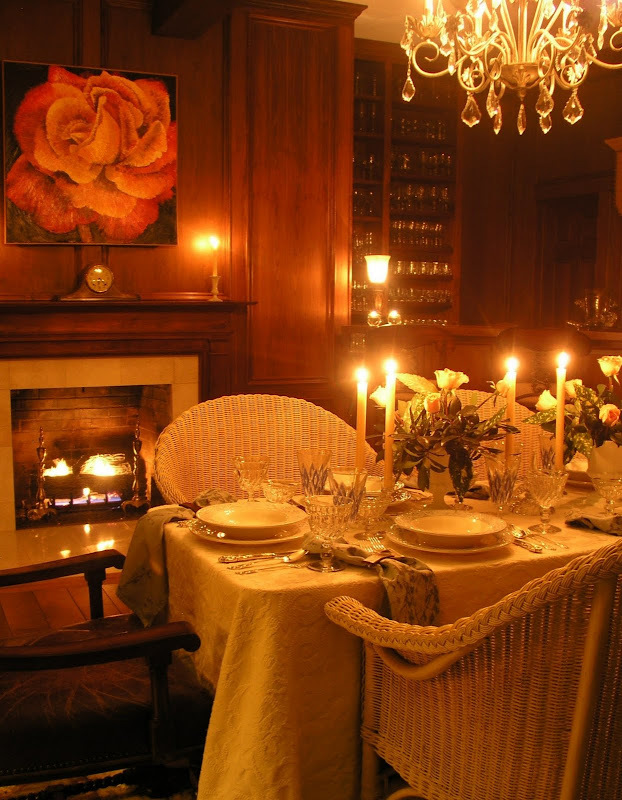 I do set design/direct musicals/plays frequently and love creating a "feeling" or a "mood"...evoking another place, another time...and I feel that you do that with each of your tablescapes. Susan is such a lovely southern lady to share this most helpful photography tip with you. Are are you the most wonderful southern gentleman for passing it along to us. YOur tables are always ART and the lighting is "MAGIC"! You can coax the very best out of all your tables. I am always left with a sense of awe in the way you consistantly bring true magic to your tables... but I think lighting is only part of it! Thank you for the tripod tip. I don't have a very steady hand. I'll be shopping for one very soon! I always love my visits. You've definitely got the magic! I somehow missed some of these! 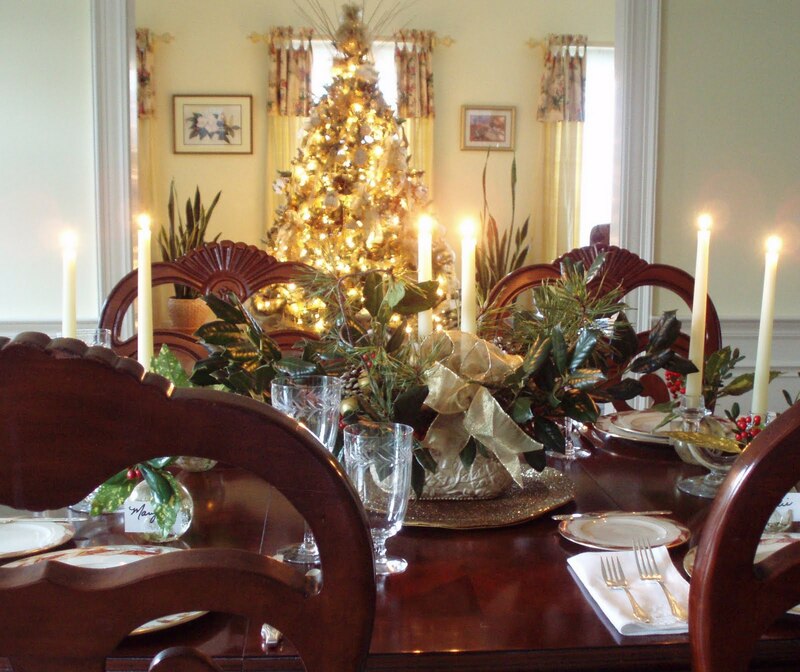 Wonderful post, wonderful job on each and every tablescape! Bill, nobody does sparkle as well as you do! Your amazing crystal collection is really shown to perfection in these photos! I'm sure one of the 49 comments before me used the phrase "eye candy," but this post truly qualifies! Magic, indeed. I joined TT in May so missed many of these posts originally. I find myself lingering over each and every one. I am a photographer and to me it is "all about the light". You have found the magic in the light and your photographs now show the magic in your artistry on the table. It would be impossible to choose a favorite but I love the one with the snow outside (so romantic!) and the one with the photographs on the table. This is a post that I will return to again and again. Thank you for the beauty that you share with all of us. I am not into films so cannot comment on the words. 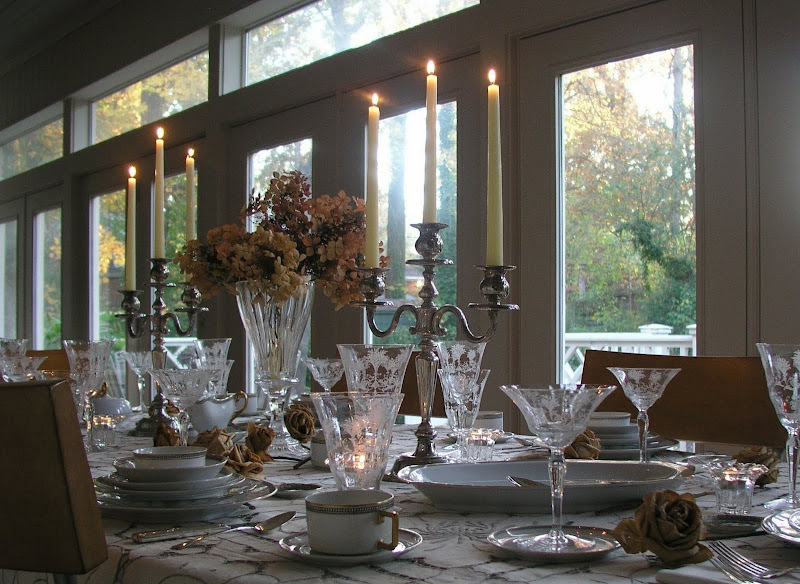 I just know that I love your tablescapes, the more dramatic and romantic the better!!! The lighting or lack of it adds so much more!! 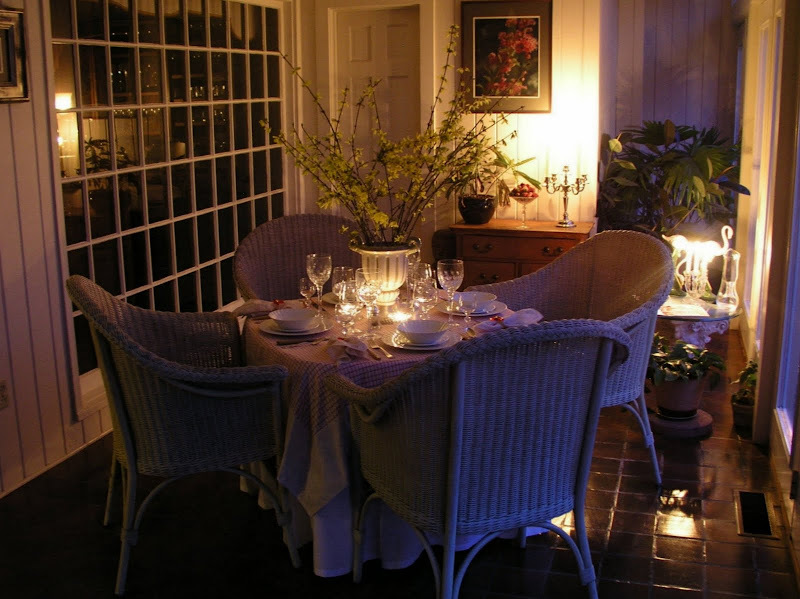 The different rooms, veranda or garden add to it all! Thank you for showing me such creativity and artisic skills. Jackie , Surrey, UK. WOW!!!! Bill two words...simply stunning! Wow, you've got some really great eye candy going on here today! 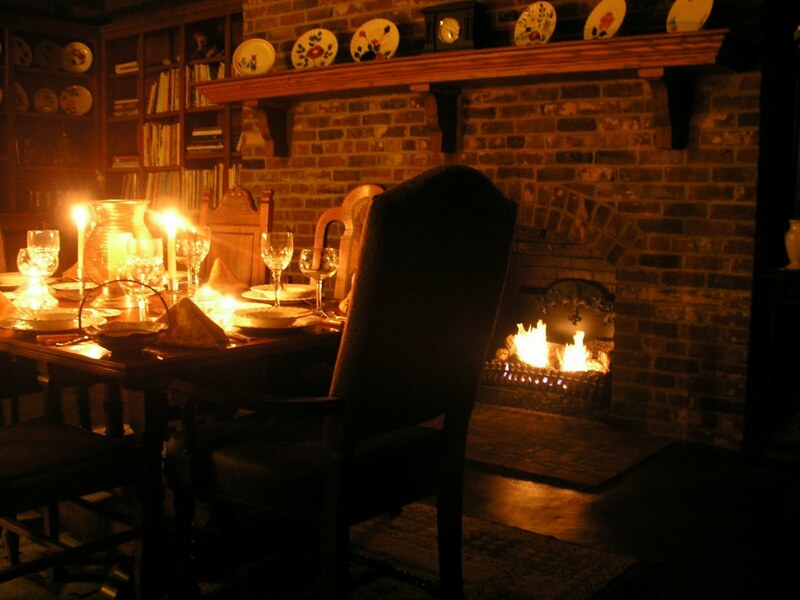 Love the use of candlelight. Aww Bill who can beat your Tablescapes I mean really!? I love British actress, Vivien Leigh and movies from the 1950's. I think my favorite actress of that time is Grace Kelley. You really outdid yourself this time. I have not participated in the Tablescape Thursday for so long. So glad I did so I could see your wonderful table once again. bill, I can't believe how lovely all the tables were... 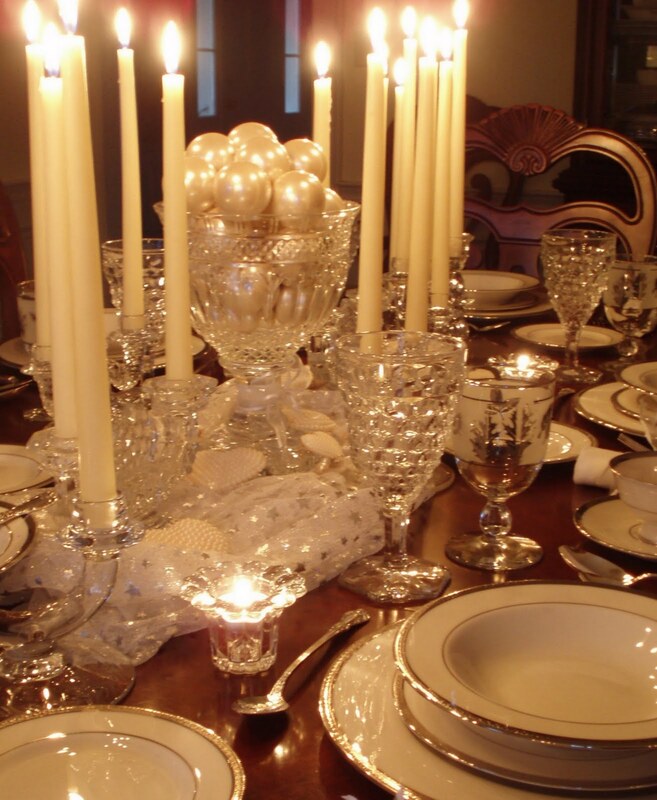 I especially loved the etched glass, the blanche table... with all the gold and white milk glass. and the candles on the stairs... 5 gold stars!!!!! what a breathtaking feast for the eyes. thank you! Oh Bill, we all want magic and you've given us all so many glimpses of your magical and creative work. Magical, beautiful, inspirational, perfection. Well, your book is complete and it should be called "Magical Moments". Bill, I love all these images, I really don't know which one is my favourite and you know how much I have always loved all your candlelight shots, they are soooooo romantic and fabulous. All your settings are dreamy and heavenly. I really feel like I am there in each and every one. Everything looks fantastic, the flowers, the settings, the china, the paintings on the wall and your home..... oh my, your home is so inviting. I'm sure one day it will be open to the public once your book is published. Sending you lots of love, happiness and joy while your styling and finding treasures. 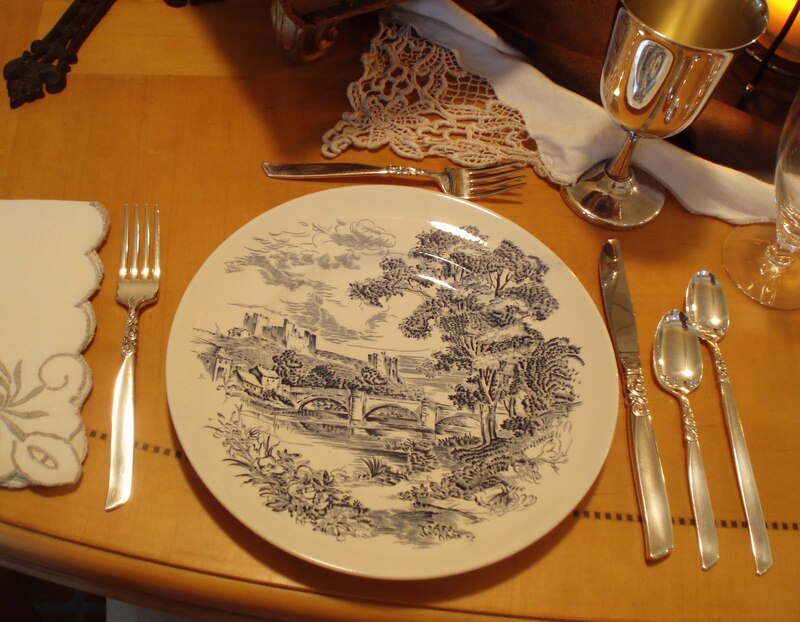 Sometimes I really believe certain objects are meant for certain people to have, you have the touch, Bill, with lovely tablesetting pieces and the way you put them all together is pure magic!! I hope there is a place for me at any one of these lovely tables. Oh, I want magic too!!! And your tables are definitely magical! 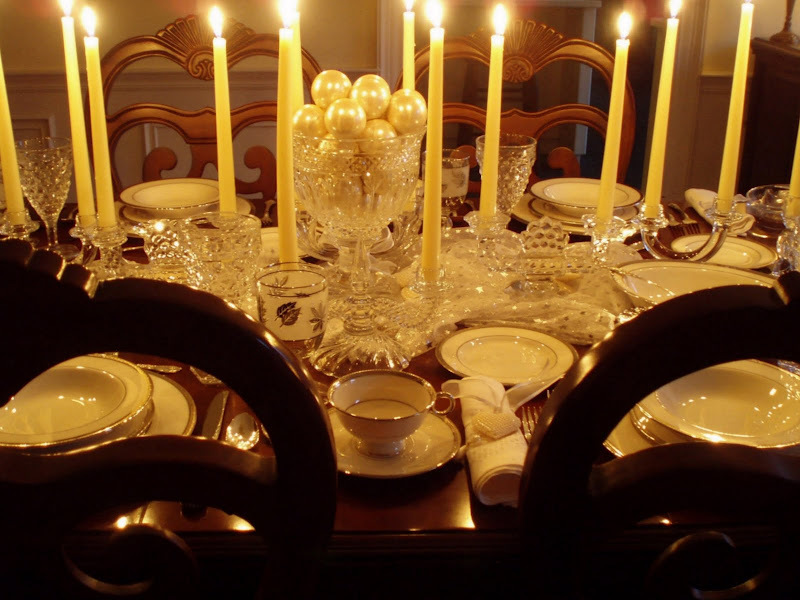 It was wonderful to see some of your past tablescapes ( I admit I have been meaning to look back at some of your older tablescapes that I missed before I became a follower of TT and your blog, but I haven't gotten to all of them yet!) I was delighted to see a fun napkin fold, called the "Artichoke" in one of your pictures, with a votive candle in the middle! One of my fave fancy folds! Stunning! You have talent, and such a creative ideas. Bill-I have just gotten back from the beach and late with my visit--but I believe "enchanted" is the word I am looking for! I have always thought you were a master at capturing the light and now I know that you are! What a wonderful collection of images. They are art in themselves! I am in love with that fabulous rose piece of art over the mantel. I have a special love for Tennessee Williams characters (for some reason I was always assigned those parts in drama class in college :) The music is gorgeous!!! Thanks for a wonderful post. You have indeed created "magic". Hyacinth Bucket (it's BOUQUET!) 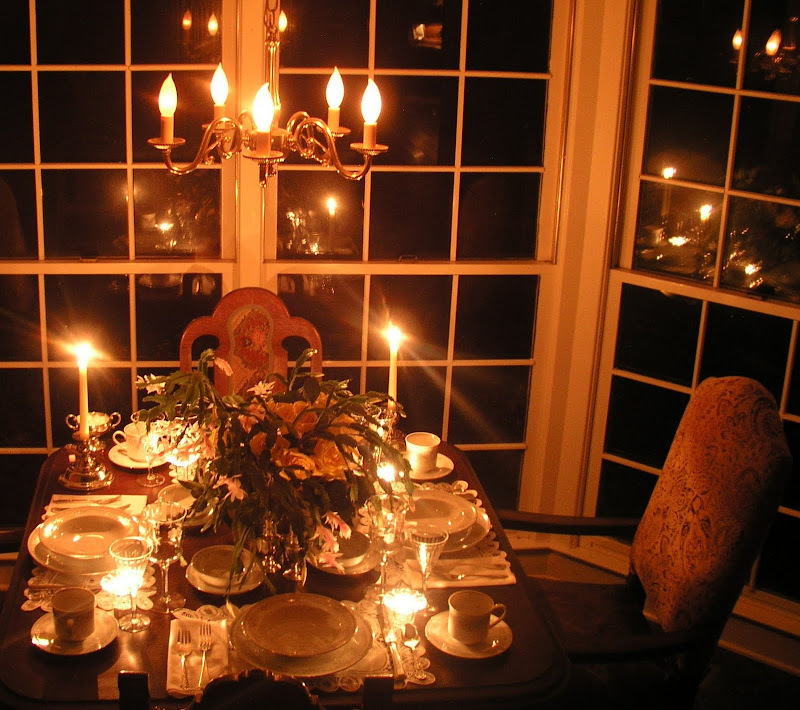 would be impressed, if not jealous of your beautiful candelight suppers! To call what happens with light in your photos magic is an understatement, Bill. Some of them are nothing short of spectacular. And the very first one... it really tells a story. Thank you for sharing your talents, it's a treat to study & enjoy your photos. I love all of your post!! What a wonderful review!! I thought I had seen them all but there were a few surprises that I didn't remember. 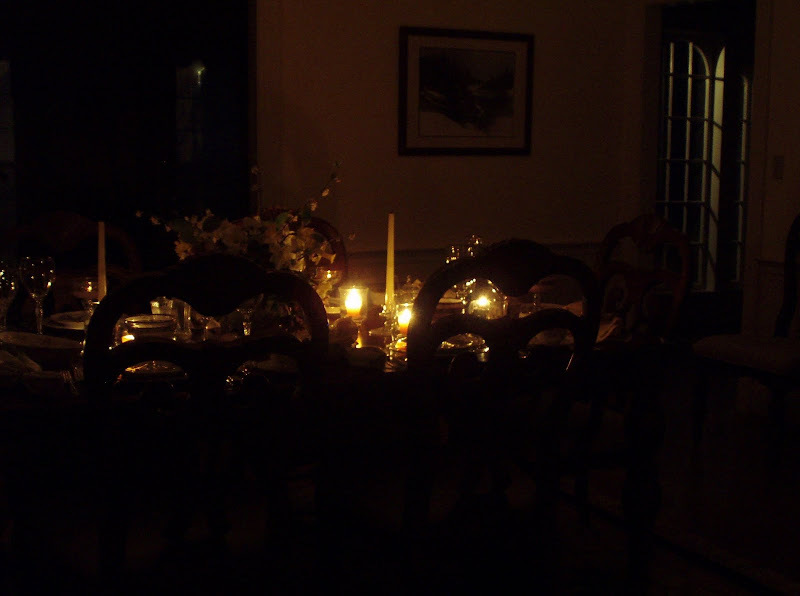 Such beautifully presented scenes & the gloriously photographed candlelight would make an outstanding book, Bill! I would buy it just for future reference especially since your posts contain so much wonderful historically accurate information. You teach, you inspire & entertain...what more could a person ask for? I gushed over every one of your beautiful photos...the one with the snow in the background was such a wonderful surprise...we so rarely see snow. Gorgeous, gorgeous pics! OMG!!! Let me catch my breath....to such magic and beauty! 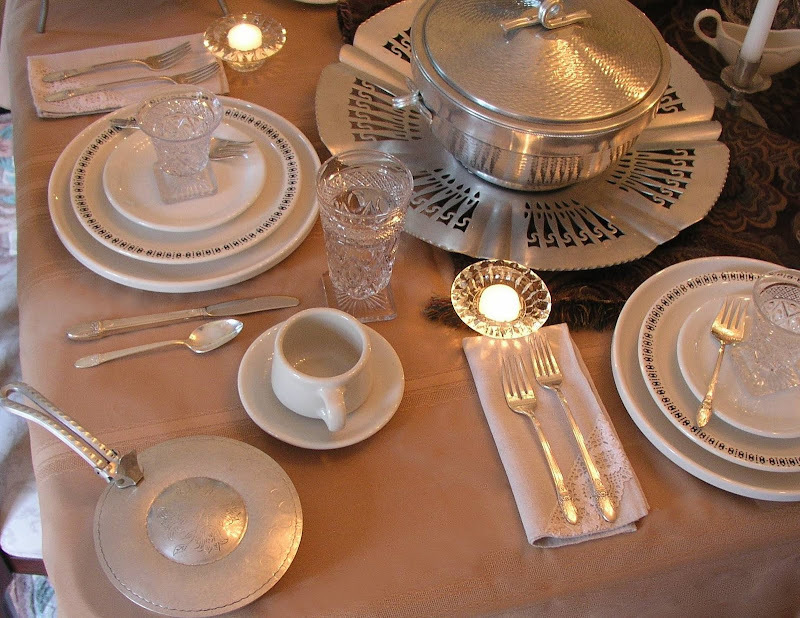 Your gloriously set and photographed dinner tables and pictures kill me...lol I love to do a ot of what you do for my dinner parties, I'm thrilled cause I adore doing beautiful tables too, my friends always give me complements....but now, I can become a pro learning from you. I have lots of glasses, 14 sets of dishes, between china-porcelain, stoneware, hand decorated in South Am., dishes,Xmas china and glasses etc....and love using them all. Thank you so much Bill. I love U. Playing King & Queen of the Castle!